It isn’t often anybody gets the chance to ask that fundamental and fascinating question: what is the point of a national portrait gallery? The question is rare because portrait galleries are rare. America has one. A spurt of hasty googling confirms that Australia and Canada have them, too. Internationally, I think that’s it. If there are more out there, they must be keeping a low profile, because I have not come across them in 30 years of busy art journeying. Portrait galleries are rare because the artistic circumstances that prompt them are rare, and particular. These are not artistically propitious circumstances in which to start an art collection. The politics of such situations are glaring and disfiguring. Perversely, the mother gallery in London, which opened in 1856, is the one with the most innocent artistic reason for being there. Portraiture has played a hugely important role in the progress of British art, from Holbein to Van Dyck, Gainsborough to Reynolds. Devoting a single museum to it makes artistic sense. 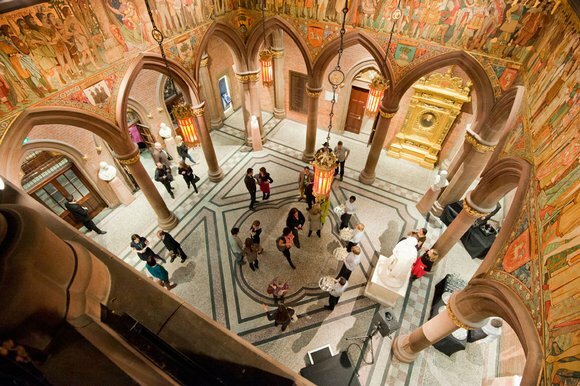 That is also true, to a point, of the gallery that has prompted these uncomfortable agonisings of mine: the Scottish National Portrait Gallery, in Edinburgh, which has just reopened after a £17.6m facelift. The big makeover was certainly necessary. Located in a doomy gothic mansion, built in the 1880s and modelled, apparently, on the Doge’s Palace in Venice, the SNPG has always felt like an institution catering chiefly for spiders and their cobwebs. At some point in the 1960s, its original air of belated medievalism was overwhelmed by a taste for low ceilings and hessian cladding, creating a glum environment more suited to a fax store in a local government basement. To make it all worse, the building was shared with the Scottish Society of Antiquaries, which nabbed half the space. All of this forced the SNPG to appear unloved, gloomy and out of date. That impression has now been thoroughly dispelled by a clear-out that feels like a reopening of all the windows. The antiquaries have been sent packing and the entire building has been reclaimed for art. Where possible, the original architecture has been uncovered, and the opening space — a magnificent gothic vestibule featuring a parade of ancient Scottish worthies trooping through in a mighty march-past — has been cleaned up and relit, so its impact can once again be rousing. In the middle of the museum, a large glass lift has been inserted, enabling an exciting ascent. And the top galleries, in particular, are suddenly bright and elegant as they sweep round the building in a succession of top-lit spaces that are perfect for portraiture. In architectural terms, the remodelling is a clear success. Less certain is the new identity assumed by the displays in these refreshed spaces. You would have thought a portrait gallery’s task was obvious: to show the best pictures of the most interesting people in more or less the right order. That is not what happens here. The opening gallery jumps straight to the 18th century, with a room devoted to the relationship between the superb Enlightenment portraitist Allan Ramsay and the philosopher David Hume. The next space, however, leaps back a couple of epochs to the 16th century, where the portrayal of Mary, Queen of Scots triggers the first instalment of a building-wide examination of the tortuous relationship between the English and the Scottish. Two rooms down, and already it is unclear what thread we are supposed to be following. Although the journey ahead sticks mostly to a rough chronology, the gallery ignores the calendar at regular intervals by throwing in those thematic displays that are all the rage in museums right now: the ones that replace the laws of chronology with the rules of roulette. Coming around one corner, you suddenly find yourself in the middle of a sequence of Scottish landscapes, produced in the 18th century by a visiting German. Another corner leads into bleak views of Glasgow’s slums by the 19th-century photographer Thomas Annan. Then there are wartime scenes of Scotland’s sea defences by the Belfast-born John Lavery. It’s a head-scratching sequence that left me wondering furiously what the sights in front of me had to do with portraiture. From the brilliant Ramsay to the energetic Henry Raeburn, Scotland has a portrait tradition to be proud of. Why isn’t it more determinedly proud of it here? Nobody could deny the contributions to science, philosophy, literature and art made by numerous great Scots. Why not celebrate them fully, frankly and in the right order? Back at the foot of the lift, where most visitors will begin their visit, a large wall cringingly entitled “Hot Scots” displays photographs of familiar Scottish faces plucked out of the current celebrity ether. Susan Boyle is here. So is the old and best Doctor Who, David Tennant. There’s Sean Connery and a chef called Tom Kitchin. And Nicola Benedetti. I suppose it’s an attempt to signal the gallery’s contemporary willingness to get down with the people. A hundred years ago, these would have been writers and artists, politicians and philosophers, inventors and agitators, not the pop star who sang Pencil Full of Lead and the red-headed girl out of Doctor Who. The writer and artist John Byrne is on a nearby wall, at least. Another unhelpful force at work is the adoption of a defensive position in what we might call the Alex Salmond moment of Scottish history. As I was enjoying some historic portraits of large Scottish warriors dressed in dramatic knee-to-neck tartans, the voice erupted over the loudspeakers of a woman reading a Gaelic poem with all the noisy subtlety of the announcer at a railway station. It made it impossible to concentrate on the pictures. In the section that examines the identity of the Modern Scot, there’s a creepy portrait, painted in the 1930s, of the writer Fionn MacColla, a leading player in the National Party of Scotland, wearing a fascistic uniform that Mussolini himself would have been proud to parade in. I was left with the impression that I had wandered through a conflicted institution. Some of its doubts concerned the current viability of a portrait museum. Others were triggered by the surrounding spirits of nationalism. Instead of celebrating the superb tradition of Scottish portraiture with the open-hearted admiration it deserves, the new SNPG feels as if it is looking over its shoulder, trying to second-guess the opposition.